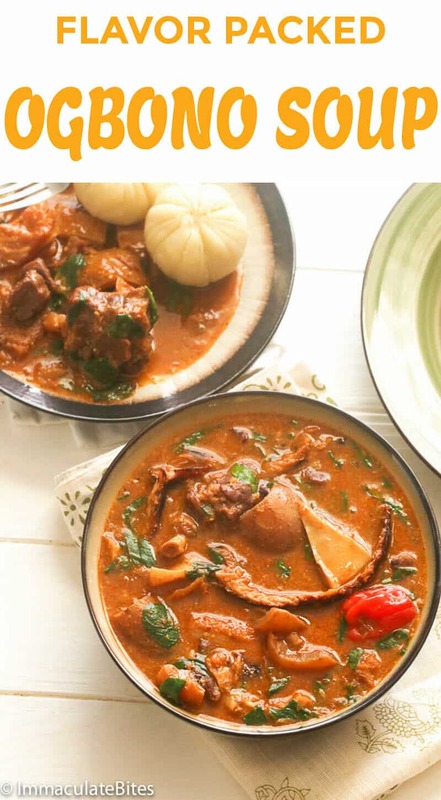 Ogbono Soup and Pounded Yam from Scratch – A tasty and hearty Nigerian soup made from Ogbono seeds (bush mango seeds) added with pre cooked meat . And paired with smooth, tasty and filling Pounded Yam for an extraordinary African meal experience! Ogbono soup is a hate or love it soup . Yes, didn’t grow up eating it but quickly fell in love with it after moving to the US. It’s appeal? Chunks of meat and fish. Annnd it’s comforting and hearty. But the draw? Yes that’s the appeal for most folks. I know my son can’t eat this – I tell him he doesn’t know what he is missing . So when my cousin brought home some ogbono seeds (a gift from his friend), I know for sure what to do with it. 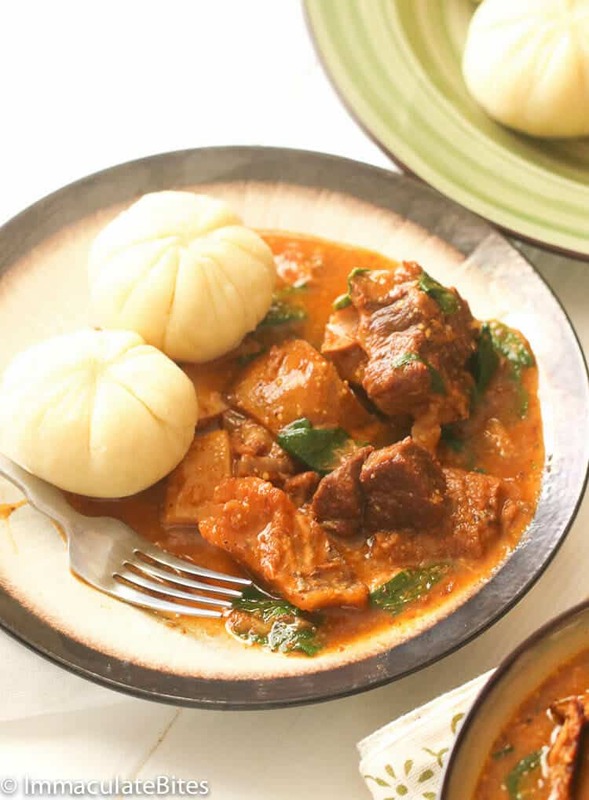 It would only befitting to whip up a good Ogbono Soup paired with pounded yams shaped into bite-sized dumplings. I don’t know about you, but ever since I watched a documentary on T.V about commercialized powdered yams, I started being more conscious about my yams. I try as much as possible to make my own food from scratch. Not quite there yet. Still a work in progress. This pound yam are *THE* real deal. Wholesome yams made from scratch using a food processor. Comes together effortlessly. What is ogbono made of? For those few who aren’t familiar with Ogbono seeds, they are often times called with names like wild mango, African mango, bush mango and dika. The trees bear edible mango-like fruits and the seeds (also called dika nuts) are basically like nuts that can be eaten raw or roasted. Seriously I don’t know anyone who eats this as a snack but some say they do. Who am I to say otherwise . 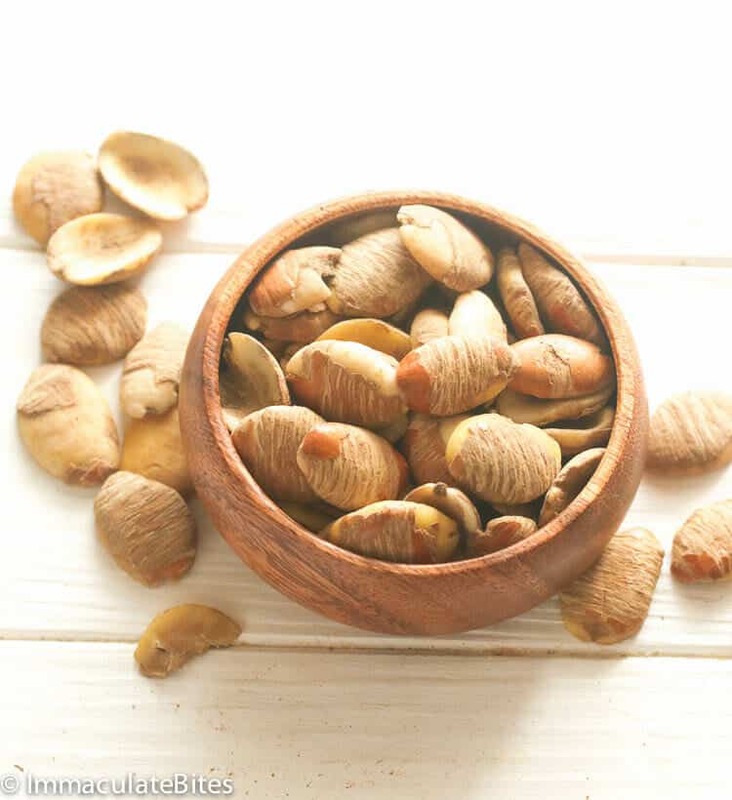 These are most often ground and use as a thickening and flavoring agent in soups and stews. It has a distinct aroma to it. Some find it appealing while others don’t. Don’t ask my son. I do find them quite appealing. To each it’s own, I say. 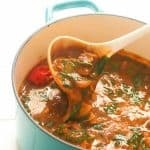 How to make ogbono soup? 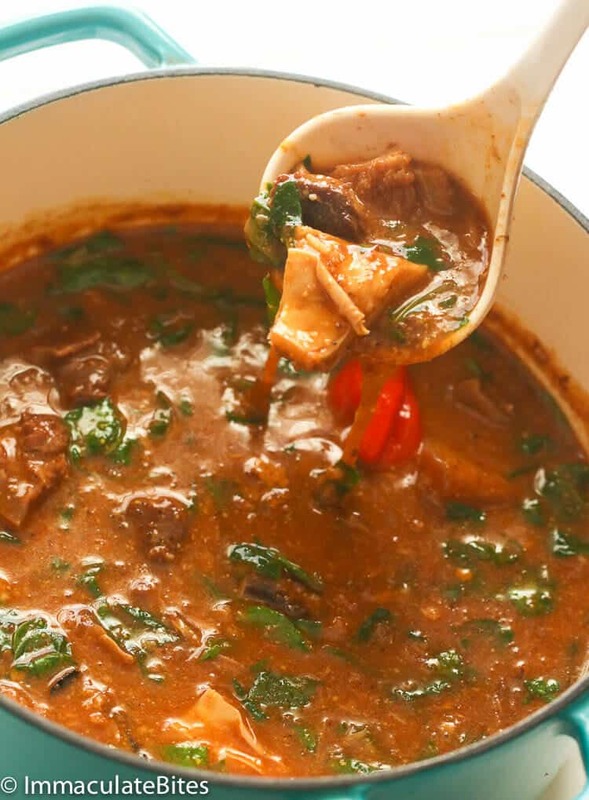 There are couple of ways to prepare Ogbono Soup. Some like it plain with no added veggies (like those served for babies) and others would love some bite into it like chunks of veggies and proteins. I’m a carnivore – lots of protein. If meat is not your thing, go with smoked fish and shrimp. Yes, yes yes. 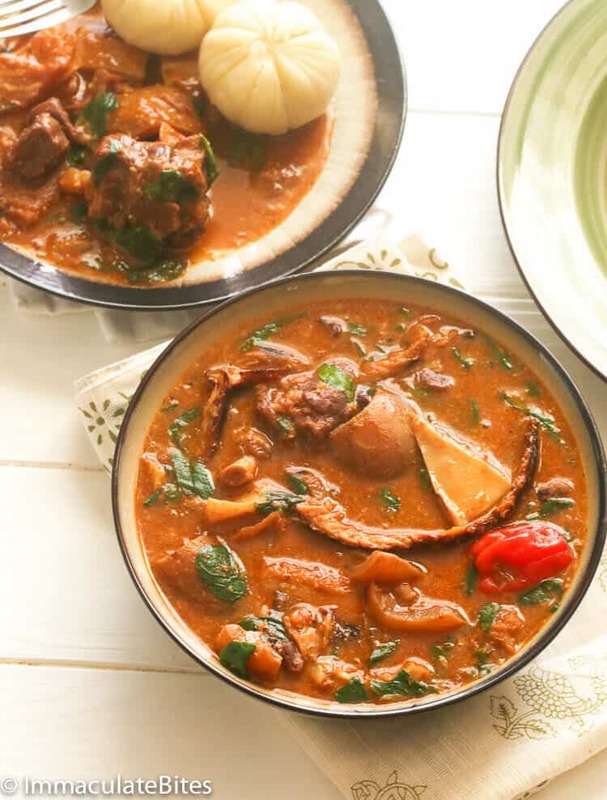 Whatever rocks your boat, this Ogbono Soup is sure to deliver a plateful of great flavors in every serving. And oh, do you know that this Ogbono soup reheats well? Let it rest overnight and reheat the following day. You’ll be surprised on how the flavor has meld well. Pair it with some pounded yams or other choices of fufu for a more indulgent meal! 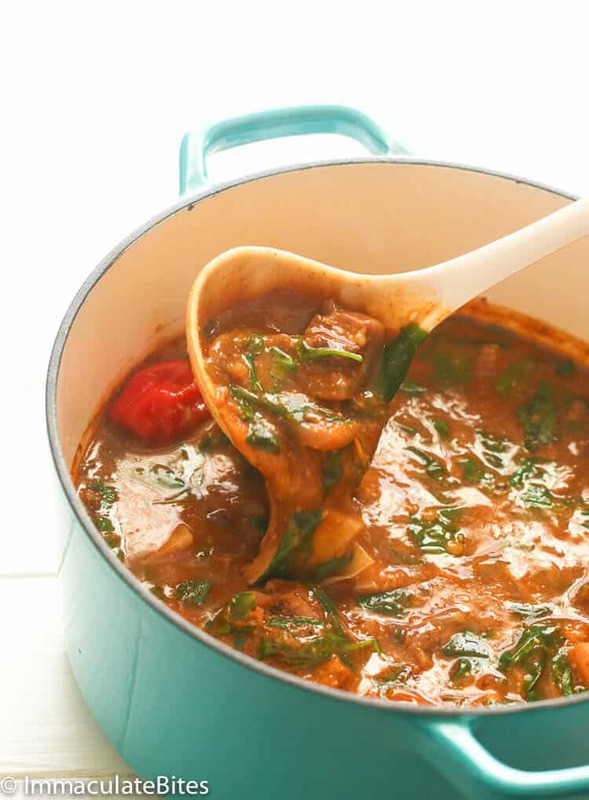 Most African soups use a plethora of meat and fish to cook soups – it all depends on the individual preference and pockets. Ogbono soup is no exception. I like to use a variety including smoked or dry fish. If using a variety, it’s best to boil separately because they each have a different level of toughness. And some are precooked. Use best judgement when boiling and selecting meats. You can’t substitute ogbono seeds in this recipe. However, throw in some egusi and okra and you are good to go. And if you want the draw which is synonymous with ogbono soup then don’t forget okra. For the greens use whatever you have on hand ( kale, African greens (callaloo), spinach, turnips, water leaf, etc.) Frozen greens work as well. Thaw completely before using.Use spinach, collards, turnip greens or kale. Ogbono Soup and Pounded Yam from Scratch – a slimy yet tasty and hearty Nigerian soup made from Ogbono seeds (bush mango seeds) added with pre cooked meat . And paired it with smooth, tasty and filling Pounded Yam for an extraordinary African meal experience! 1/4 – ⅓ cup palm oil. In medium –sized saucepan boil meat, season with salt and pepper until tender (approximately 30-60 minutes depending on the choice of meat). You can shorten this process in half by using a pressure cooker. Boil the cow skin and tripe together or you may do so separately until tender. Use best judgement . Remove cow skin, tripe and add to the pot of boiled meat. Add smoked fish, if using any. Be sure to have enough stock from the meat (about 3-4 cups). Mix ground ogbono with red oil, then add to the pot of boiled meat, followed by crayfish and scotch bonnet pepper, bring to a boil. Simmer and let it cook for about 10 minutes or more. Add chicken bouillon or cubes, if desired. Add more stock water as needed to get to desired thickness. Then add spinach cook for another 2-3 minutes, turn stove off and serve piping hot. Peel the yam with a sharp knife, peeling away from your body carefully draw the paring knife down the body of the yam, being careful not to remove too much of the yam in during the process. Look for any spoiled spots, such as bruising and discoloration, in the yam as you peel. Remove the spots away with the tip of the knife. Cut into large chunks and wash immediately to prevent discoloration and leave them in cool water until ready to use. Add yams in a medium pot with water- enough to barely cover the yams salt to taste, if desired. Boil until tender, remove from heat and immediately drain yams thoroughly in a colander. Reserve some water from the yams to use for blending. Add pounded yams into food processor. Start blending then pulse every 20-30 seconds to check for smoothness. I use a spoon to move yam around the food processor as necessary to ensure even blending. Add about 2 tablespoons or more reserved water as needed until you achieve desired texture. Pounded yam should be stretchy and soft. Wrap in a parchment paper (for the health conscious or plastic wrap). Peel the yam with a sharp knife, peeling away from your body carefully draw the paring knife down the body of the yam, being careful not to remove too much of the yam in during the process. Look for any spoiled spots, such as bruising and discoloration, in the yam as you peel. Remove the spots away with the tip of the knife. Cut into large chunks and wash immediately to prevent discoloration and leave them in cool water until ready to use. Add yams in a medium pot with water- enough to barely cover the yams salt to taste , if desired. Boil until tender , remove from heat and immediately drain yams thoroughly in a colander. Reserve some water from the yams to use for blending. Add pounded yams into food processor. Start blending then pulse every 20-30 seconds to check for smoothness. I use a spoon to move yam around the food processor as necessary to ensure even blending. Add about 2 tablespoons or more reserved water as needed. You achieve desired texture. Pounded yam should be stretchy and soft. Wrap in a parchment paper( for the health conscious or plastic wrap). Serve with ogbono soup (recipe below). 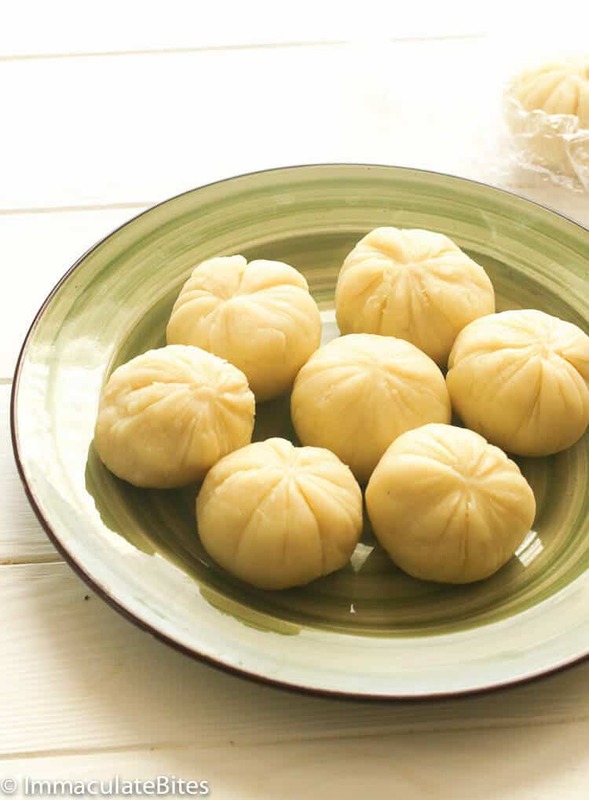 In medium–sized saucepan, boil meat, season with salt and pepper until tender (approximately 30-60 minutes depending on the choice of meat). You can shorten this process in half by using a pressure cooker. Boil the cow skin and tripe together or you may do so separately until tender. Use your best judgement. Remove cow skin, tripe and add to the pot of boiled meat. Add smoked fish , if using any. Be sure to have enough stock from the meat (about 3-4 cups). Mix ground ogbono with red oil. Then add to the pot of boiled meat. Followed by crayfish and scotch bonnet pepper. Bring to a boil. Simmer and let it cook for about 10 minutes or more. Add chicken bouillon or cubes, if desired. Add more stock water as needed to get to desired thickness. Then add spinach cook for another 2-3 minutes, turn stove off and serve piping hot. I’ve mostly heard of this food mentioned in Nigeria movies ,and Wonder it’s made up of. Thanks for the recipe. Keep it up. Hello Imma. Thanks for the recipe. However, you forgot to put the link of where to buy the ogbono online. Also, can i ask about the documentary for the powdered yam flour? Do you know any website where i can buy yams online? This took me back to my home in Limbe (Cameroon).I like Ogbono soup, I ate this soup almost every week while growing up.Ogbono soup is also eaten by people from Mamfe(cameroon) and it’s one of their main commercial crop. Thanks Imma for sharing this and especially how to make real pounded yam. Hi Rose, Thanks for taking time out to share your thoughts . The real pounded yam can’t be beat, nothing like the commercialized version. Looks scrumptious! Would definitely give it a try. If using Egusi, it should be added before the ogbono/palm oil mixture right? right, add before the palm oil and ogbono mixture. Migerian students I roomed with in College used to make semolina fufu to eat a boiled chicken & tomato stew. We ate that probably 4 times a week. We’d take a blob, scoop some stew chunks up and eat away. Fun finger food, great memories. Oops. Nigerian students, and this was back in the early 80s. Looks so delicioussssssss. I could eat it through my phone. Am delightful surprised to see my fav here… Great Job Ma’am..i give you 98/100’%. That’s an A+. Thank you so much!!!! WOW! I never thought of making pounded yam (fufu) this way, definitely going to try it.